Review by AllTheBestFights.com: 2018-06-09, good finish but it is not enough to get three stars: Jack Culcay vs Adasat Rodriguez gets two. The former Olympian and former Wba light-Mw champion Jack Culcay entered this fight with a boxing record of 23-3-0 (11 knockouts) and he is ranked as the No.16 middleweight in the world. He suffered two consecutive defeats in 2017, with Demetrius Andrade (via split decision, Andrade vs Culcay) and Maciej Sulecki (Maciej Sulecki vs Jack Culcay) but he came back to win in 2018 with Craig Cunningham. His opponent, Adasat Rodriguez, has an official record of 17-7-2 (10 knockouts) and he entered as the No.155 in the same weight class. He has already fought twice in 2018 losing to Zach Parker and defeating Michael Mora. 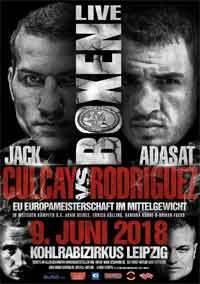 Culcay vs Rodriguez is valid for the vacant EBU European Union middleweight title. Watch the video and rate this fight!